This book will assist those already working as Sales Managers or those with an interest in working in this demanding area. It contains a wide range of information pertaining to the many different areas and facets of Sales Management. This book is an enlarged and revised version of a similar and popular title which was first published in 1994 with subsequent numerous reprints. Leading and motivating a Sales Team can be a very rewarding occupation, with high levels of personal satisfaction and reward. It is also a very difficult and challenging area - just ask the hundreds of successful sales representatives who are promoted to Sales Manager on a Friday and the next Monday find themselves responsible for the performance of their former work mates. Sales managers are responsible for a wide range of activities which include, recruiting, training and inducting a sales team, setting budgets and producing sales forecasts. Most importantly they are expected to lead, drive and motivate a sales team to achieve increased sales and profits. We currently publish a combined range of more than 100 books, CD ROMs and Training Facilitators Manuals, covering areas of business such as Business Administration, Business Planning, Finance, Human Resources, Management, Marketing, Sales and Small Business. We also have a range of Training Facilitators Manuals available covering various Management topics. It is also pleasing to record that this publication is widely used as a course text and handbook for accredited and non accredited courses. 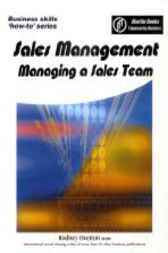 Some of our other publications may be of assistance in the sales area particularly Selling Made Simple and our Training Facilitator Manual Sales Management. We welcome your comments and suggestions.